(March 19, 2019) -- The San Antonio Area Foundation today announced the selection of Marjie M. French, UTSA Vice President for External Relations and Chief Development Officer, as its next Chief Executive Officer. French will join the San Antonio Area Foundation after spending more than a decade at UTSA, where she built a comprehensive philanthropic program that is propelling the university toward recognition as a premier research institution. A seasoned leader with nearly 30 years of experience in the management of development, advancement, alumni relations, and communications and marketing teams, French’s career includes leadership roles in three comprehensive capital campaigns and personal major gift solicitations and acquisitions from both state and national charitable foundations. 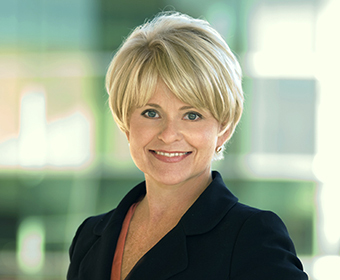 At UTSA, her portfolio included principal gifts as well as the development, advancement, alumni programs, and university communications and marketing operations. In 2009, French launched UTSA’s first capital campaign, We Are UTSA – A Top-Tier Campaign. The initiative sought $120 million in support for student scholarships, faculty and research initiatives, campus activities, and community outreach programs. In early 2013, UTSA surpassed its $120 million goal and, with two years left in the campaign, set a new goal of $175 million. By the close of the capital campaign in 2016, the university had surpassed that goal and secured more than $202 million in gifts and pledges. Through the campaign, which was supported by nearly 33,000 donors, UTSA secured 143 new endowments including 70 endowed scholarships, 41 endowed faculty positions and nine endowments providing 32 graduate fellowships. Additionally, UTSA received its largest single private gift, $22 million from the estate of Mary E. McKinney. More recently, French has led efforts to expand philanthropic support for UTSA students and researchers and to facilitate the expansion of the UTSA Downtown Campus as part of the city’s high-tech corridor. Last year, French guided UTSA in securing $37 million in gifts and pledges, setting a new annual fundraising record for the university. French will begin her role as San Antonio Area Foundation CEO on April 8. She will be responsible for managing more than $900 million in assets to educate youth, preserve the environment, protect animals, fund research and provide services that enhance the quality of life for people living in and around San Antonio. A native Texan, French earned her bachelor of arts degree from the University of St. Thomas in Houston. From 2005 to 2008, she supervised all aspects of development at UT-Dallas including operations, alumni relations, major gifts, annual fund, communication and endowment services. Under her leadership, total giving increased by 50 percent and alumni participation increased by 70 percent. From 2000 to 2005, French managed the Dallas major gift program for UT-Austin’s $1.6 billion “We’re Texas” campaign. Additionally, she led fundraising that resulted in the creation of the Real Estate Finance Center at UT-Austin’s McCombs School of Business. At the University of Houston, she supervised development programs for both the Honors College and the College of Architecture during the university’s $350 million creative partnership campaign. In the coming days, Eighmy will appoint a search committee and launch a national search to fill French’s role. The university has retained education philanthropy executive Karl Miller of Bentz Whaley Flessner as a senior level advisor for development, advancement and alumni operations during the transition period.